The Blue & Gold application is now closed. Please check back in the Fall to apply. The Blue & Gold Program is comprised of an exclusive group of our members who are eager to learn, grow, and lead in and outside of GWWIB. By demonstrating a strong sense of passion for GWWIB's mission, we reward these members with extra professional programming and exclusive mentorship benefits. 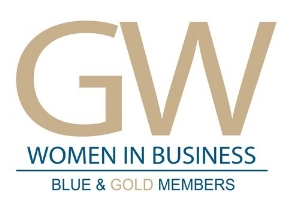 Mentorship in Blue & Gold entails the opportunity to connect with GWWIB Board members, featured GWWIB alumni, and our partner professional organization, United Women in Business. These three groups serve as a strong source of both peer and professional mentors for our members to learn from and connect with.